1. Very few people really know how to use Excel properly. Even fewer programmers working in finance use it to its full potential. 2. Most of them aren’t any good at explaining it! Michael is one of these nerds who learned how to make Excel cool… and understands how people really learn. The key is making people feel comfortable and using a down-to-earth teaching style. Once people lose their fear of Excel amazing things happen. His classes are proof of this. Furthermore, his classes reveal techniques used by these elite individuals –not the generic lesson plans you’ll find in most standard course books. His students range from financial analysts learning to write macros to mothers re-entering the workforce who need “proficient in Excel” on their resume. Look no further than the video on this site to get a better idea of the connection Michael creates with his students. Michael learned his trade while working at an energy hedge fund in Manhattan (founded by former NYMEX president Robert Collins) where he managed Excel-based option pricing models for natural gas options traders. These were spreadsheets that had to function like Indy cars in a daily high-stakes race. He then refined his skills at JP Morgan where he built several dynamic VBA-driven databases for the Corporate Access division. 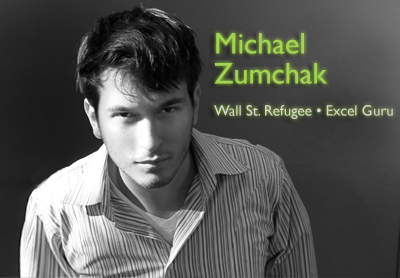 Michael has taught basic and advanced Excel modeling techniques to over 2000 students and employees of several major banks and companies including JP Morgan, TD Securities, Barclays, UBS, RBC, the United Nations, and the US federal government. In addition to teaching and consulting, Michael enjoys playing the great piano concertos from the classical and romantic eras. He received his BA from New York University.